Jeff Bauman (Jake Gyllenhaal) is a chicken roaster for Costco. He lives with his mother, Patty (Miranda Richardson) in Boston. For Patriot’s Day, Jeff wants to support his ex-girlfriend, Erin (Tatiana Maslany) who is running the Boston Marathon. Unfortunately, on this Patriot’s Day in 2013, terrorists set off pressure cooker bombs near the finish line of the Boston Marathon, and Jeff was severely hurt by the blast, losing both legs in the attack. Jeff’s future is uncertain, but he decides to get prosthetic legs. The pressures of sudden fame begin to affect Jeff, he is asked to wave a flag at a Boston Bruins Stanley Cup game, and the roar of the crowds, and flashing lights, make him flash back to the day of the marathon. Erin is wracked with guilt because Jeff was at the Boston Marathon to support her. Erin decides to stay and help Jeff, but she is unsure of their future together. Patty sees Jeff’s injuries as a chance to meet famous people and gain fame and money. Jeff becomes filled with doubts, why did he survive, is he a hero? Will Erin come back to him, or does she pity him because of his injuries? He starts missing rehabilitation appointments, and doesn’t really seem committed to recovering his mobility. Then Erin visits Jeff with some news, what is the news? Does the news change Jeff’s mindset? This is an instant classic because it’s a bracingly real look at the life rehabilitation of a double amputee. It shows the viewer all the hardships that Jeff has to face, including things that most people take for granted like taking a shower, or going to the bathroom. This film pulls no punches, it doesn’t glamorize Jeff, or make his family perfect, or perfectly capable of understanding Jeff’s physical and emotional needs. The film understands that the consequences of becoming a double amputee also falls on the caretakers, and that can cause a lot of stress in a family. This is a hard movie to watch at times, but it is worth the emotional rollercoaster ride, because all the emotions feel so real. The ending may seem a little Hollywood, but not blatantly so. This is probably Jake Gyllenhaal’s best film. He plays Jeff as a complex, multi-layered human being. Jeff is a nice guy, but not perfect, he caused his girlfriend to break up with him three times. He’s a guy who hasn’t grown up yet, but has this huge weight thrust on him. The viewer sees the doubts creep up in Gyllenhaal’s eyes, hear the doubts in his quivering voice, it’s a masterfully understated performance. Thankfully, his Boston accent is also understated. Tatiana Masaly plays a character filled with guilt, but Erin is no shrinking violet, she expresses her anger and frustration with Jeff and his family regularly. Her performance makes the movie more interesting to watch. Miranda Richardson is an interesting character, not a bad woman, but always someone with an angle, trying to exploit what happened to her son for money or fame, which brings her into frequent conflict with Erin. The direction starts out with a few experimental shots, like the camera looking out of a peep hole, and trying odd angles, there is one extended shot of the amputated legs, but he doesn’t overuse the amputation, and even in the scene Jeff’s legs are blurred in the background, and not emphasized. The director eschews special effects and concentrates on keeping the pacing fast and focusing on the rehabilitation story and the strife caused because of Jeff’s struggles to adjust to his new circumstances. The terrorist attack is almost tangential to the story, as it should be. Stronger: Run to watch this excellent film. A group of six astronauts from the international space station recover an alien species from a Mars probe, and try to bring it back to earth for further study. The single-celled organism, which the crew nicknames Calvin, lies dormant for a while, until one of the astronauts, Hugh Derry (Aryion Bakare) tries to bring the organism back to life, with electric shock. The treatment works and the organism begins to grow, but will Hugh Derry and the rest of the crew regret their decision to bring this alien life form back to life? This is a movie that tries to combine The Martian, Gravity, and the Aliens movies into one movie. But it’s not as smart and funny as The Martian, it’s not as scary as any of the Aliens movies, and it’s very predictable. The viewer knows what’s going to take place in this movie from the first minute of this movie to the last. The movie tries to build some relationships early on in the film, but they don’t do enough character development to make the viewer care about any of these characters. The scenes are also very redundant, the astronauts never seem to learn from their mistakes, while the alien is learning constantly. The science is junk science too, why should an alien creature respond to an electric shock to revive it? Humans respond to electric shocks to stimulate their hearts but why should alien organisms react in the same way? Also, later in the movie, the viewer learns that the alien needs oxygen to survive. There is .1 percent of oxygen on Mars, how could it survive on Mars, if it needs oxygen to survive? The writers try to add a twist ending to the movie, but I had stopped caring long before this movie ended. The acting is subpar, Jake Gyllenhaal, who is the best actor in the movie seems genuinely disinterested in giving his character any personality whatsoever. He acts like he’s playing a supporting role through most of the movie, and when the lead role is thrust on him, it’s far too late to care. Ryan Reynolds plays the same fast-talking wise guy that he played in Deadpool. Unfortunately, the snarkiness of this character does not play well as an astronaut. Astronauts are serious people who need to know a lot of science or else very bad things happen. Reynolds lack of seriousness in this role shows bad form, thankfully, it’s a small role. Rebecca Ferguson is the poor-woman’s Emily Blunt, she also sleepwalks through the role. Olga Dykhovichnaya plays a generic Russian role, whose character is also a love interest for Ryan Reynolds character. Aryon Bakare does his best Chiwetel Ejifor impression, but Bakare’s role is not as well-written as Ejiofor’s in The Martian. The direction started off visually interesting, but soon devolved into special effects and explosions in typical Hollywood fashion. The pacing is bad, and the director doesn’t get good performances out of his actors. The director also did Safe House, which wasn’t that good of a thriller, and Child 44, which I have not seen. 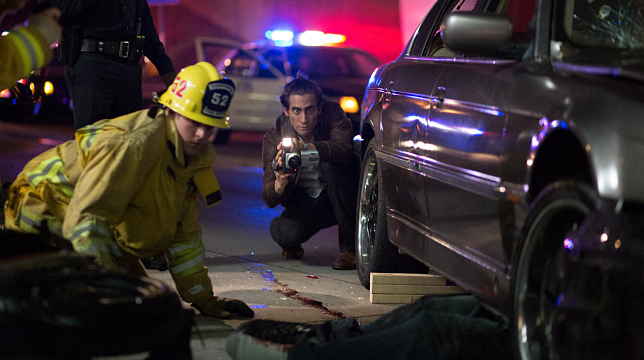 Louis Bloom (Jake Gyllenhaal) is down and out in Los Angeles. He needs money so badly, he steals scrap metal and tries to sell it for a profit. One day, Louis stumbles upon a news crew filming a car accident and has an epiphany. He sells his bicycle and buys a video camera and a police scanner. Soon he’s following police to crime scenes, a habit that police don’t like. Louis sells his first story to Nina Romina (Rene Russo) news director of the lowest rated news channel in LA. Louis is hooked on the footage gathering business. He hires a formerly homeless man named Rick (Riz Ahmed) to be his assistant, and buys a Dodge Challenger, and with Rick as his wingman, he films lots of crime scene action. But there are competitors, and when Lou loses a story to a competitor, the competitor mysteriously ends up in a hospital. One day Louis discovers a crime in progress, he arrives at the scene before the police do. His first instinct is to grab his camera, and start filming, but does he do the ethical thing and call the cops as the crime is in progress? I didn’t like Nightcrawler, not at all. In its attempt to condemn exploitative behavior by local news and the people who watch it, it becomes exploitative itself, feeding in the same violence filled trough that it seeks to condemn. In the end, it’s just typical Hollywood, shootings, bloodshed, car chases all in the name of illustrating some higher purpose. It’s also so full of plot holes that it loses any logic it might have had and takes a right turn into fantasyland. Louis and his manic behavior should have caught the attention of the authorities long before it did. There is some humor, with Louis throwing around corporate buzzwords to describe his “company” but the humor is hardly a saving grace for the film. The acting is ok, Gyllenhaal plays Louis Bloom like a cross between Travis Bickle in Taxi Driver and Raymond in Rain Man, he spews a constant stream of word salad at people interspersing facts with corporate lingo, all the while demonstrating a google-eyed stare, just to let the audience know that he’s insane in the membrane. Rene Russo plays the amoral unethical news director with little emotion, but a horrible makeup job. Is this what Hollywood thinks older women look like? Probably, and that would explain the youth obsessed Hollywood culture. Riz Ahmed plays Rick as someone even more desperate than Louis. Director Dan Gilroy gives the viewer standard issue Hollywood sequences, montages of Louis selling his video clips, car chases, shootings, blood and gore. Even though he wrote and directed the movie, he gives no insight as to why Louis is the way he is. What drove him to this point? No flashbacks, not even a hint of the trigger of the illness in the script. Nightcrawler: Opens up a big can of worms.